They cost next to nothing. They're easily found. They're not held in high esteem by other two-wheel junkies. Yet, to this collector, they're among the most interesting of bicycle artifacts. What attracts me to early (from the 1880s to the 1940s) print bicycle advertising is the way the artists and copywriters romanticized bicycling. It was a tall order, especially after 1890, when cycling boomed big time. According to G. Donald Adams' Collecting and Restoring Antique Bicycles, between the years of 1890 to 1918 there were 2,100 brands of bicycles sold in America alone. While that sounds like an astonishing selection (today in comparison, there are only a handful of American manufacturers), in reality, with a few exceptions the bikes were remarkably similar in design and construction: two wheels, pedals, a seat and handlebars, a single gear and a foot brake. This posed a challenge to the admen to wax poetic about models that were nearly identical to their competition's. They didn't disappoint. The themes border on fantastic. We see that the Monarch of 1896 (ad, top) "overtops the triumphs of twenty centuries ago," witnessed by a group of gravity-defying pedalers zipping effortlessly past the Sphinx on top of the sand. Remington's ad from the era shows its thoroughbred powered by a fit lad leaving a steam locomotive in his dust (suggesting that the bike's technology rivals the train's). Meanwhile, America's first and largest maker at the time, Columbia, humbly hawked its Chainless model (shaft-drive) in 1902 with a boy spinning up a hill that everyone else has to walk. While these themes usually exaggerate what's possible with pedal power, they're in keeping with the mania for the sport of the time. This was before automobiles ruled the roads and bicycles were America's first true individual transportation. With a bike, you were freer than ever before. Horses were hot, stank, had to be fed and could only go so far without rest. A determined bicyclist could travel far enough to experience things he may not have known existed before-—a wonderful swimming hole, a dangerous cave, a pretty neighbor. On hot days, simply coasting down a hill would cool him off. Suddenly, it was possible to visit distant friends more often and to get into town or escape the city on a whim. With a bicycle, you could join peers and tour the countryside or pack up and head out for far-flung destinations as Thomas Stevens did in 1884, leaving Oakland, Calif., and circling the globe. 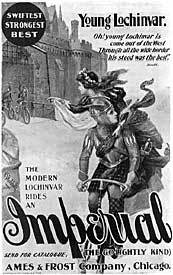 Still, it's far fetched to believe anyone really traveled back in time, as suggested by Imperial's classic Lochinvar ad of 1897 (based on Sir Walter Scott's poem). Here, Young Lochinvar in armor and kilt on his Imperial - The Go-Lightly Kind-flees Netherby Castle, Dustin-Hoffman style, with fair Ellen on his back. To attract new sales, bikes started borrowing features from motocycles (every kid wanted to emulate his dad), and ads focused on these improvements. Dad had an Indian Husky motocycle (notice that the word was spelled without the "r" at the time), so naturally, Junior, or Jimmie in the case of this ad, rode the Indian Motocycle bike complete with electric headlight, frame tank, full fenders and "motocycle type forks, saddle and handlebars." Meanwhile, the 1919 Haverford Cycle Company's Black Beauty came stock with a stand, repair kit and tool case and was surely hard to resist once a boy read the glowing description: "It's the most sensational wheel in the world. Built for the chap who wants the best and won't take anything less! You never saw such graceful lines, such fascinating color combinations, such magnificent steel construction." If you're interested in collecting vintage bicycle ads, you'll still find a few in antique shops, at flea markets and swap meets, usually in booths selling advertising. Bicycle ads are the hardest to find from these sources, yet once in a while you'll find a decent assortment. Prices usually range from $8 to $25 per ad. The best source today, however, is online at eBay. Just search "bicycle ad," and you'll find quite a collection. Keep in mind that a lot of the older ads are small (sometimes only 3" x 5" or smaller). They may look larger in the photos, so always check the description so you know what you're getting. You'll find a lot of ads to choose from. Most turn-of-the-century ads come from popular magazines of the time, such as Harpers. You'll find full-page ads or pages from the back of the magazine, which feature several small ads. I like both types because I scan them and use them on my website, and when scanned, you can enlarge the image and often see details that aren't visible in the original ads. Also offered are ads from the '30s right up to the present from magazines such as Boy's Life. These are usually 8 1/2 by 11" or larger and often in color. They depict the classic balloon-tire bikes of the era along with the Sting-Rays of the '60s, so popular today with bike collectors. On eBay, the ads usually sell for less than at flea markets and swap meets, say $5 to no more than $25, plus shipping. To me, old bike ads are the perfect collectible because they're available, affordable, and enjoyable. They're also easy to store and display. Most fit in plastic notebook pages so you can keep them in loose-leaf notebooks and place them on a coffee table for people to thumb through. Or you could certainly frame them. Also, if you have an interest in bicycle history, you won't find a better record of the development of the bicycle. Over the years, I've collected or seen ads from almost every decade of cycling. By viewing the illustrations and reading the descriptions, you have an excellent record of the development of the bicycle and the sport. In fact, you won't find this information anywhere else unless you happen upon another collector like me. What I like best about the ads, however, is how they make me feel. They're a refreshing departure from cycling's current image of teens thrashing their pedal-powered SUVs. That may sell bikes, but I prefer a kindler vision of cycling as a harmless and enjoyable pastime and a beautiful way to get around or to enjoy the afternoon. Ironically, I think that if modern makers adopted older themes, they'd actually sell a lot more bikes. To see more and much larger images, open my ad collection.